On the 18th October Kurdish people from all over the north came out to protest against the planned invasion of the Kurdish controlled northern Iraq by the Turkish Army. 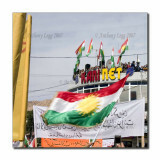 In Duhok thousands of workers, government officers and school students marched to the city centre. Let's hope that this is only rhetoric by the Turkish Government and that dialogue will bring a solution to the issue of the PKK militants.